The Agave attenuata Salm-Dyck (1834) is native to the central plateau of Mexico, where it grows, in a few specimen, between the 1800 and 2500 m of altitude. The name of the genus comes from the Greek “agaué”, feminine of “agauos” = noble, splendid; the Latin name of the species “attenuata” = made thin, with reference to the shape of the leaf. 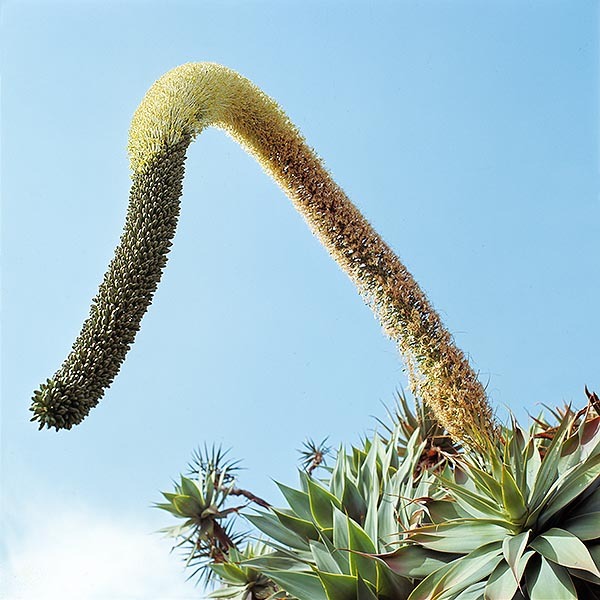 Common names: “dragon-tree agave”, “lion’s tail”, “soft leaved agave”, “swan’s neck agave”, “foxtail”, “ fox tail agave”, “smooth century plant”, “spineless agave”, “spineless century plant” (English); “agave à cou de cygnet”, “agave à queue de renard” (French); “agave-dragão”, “pescoco-de-cisne (Portuguese). Monocarpic (it blooms only once and then dies) succulent, unarmed, formed by a rosette of some tens of ovate-acuminate leaves, of a colour ranging from the green-grey to the pale bluish-green, long about 60 cm and 15 cm broad, at the extremity of a stem, tendentially prostrate, which can reach a length of 1,5 m.
It blooms starting from the age of 10 years, with a terminal racemose inflorescence, thick, bent, long up to 4 m, with greenish-yellow flowers, long about 8 cm; the fruit is an ovoid capsule long 4-7 cm of a brown colour. It reproduces by seed and through the several basal shoots. Agave which adds to the great ornamental value the absence of thorns, which renders it very suitable for small gardens or areas frequented by children. Not demanding about soil, provided the same is draining, can be cultivated in full sun or in slight shade and can resist to long drought periods, even if it takes advantage from regular watering during the summer time. It is rather sensitive to low temperatures, in fact, it gets damaged around -2 °C and dies around the -4 °C; it is therefore cultivable in full ground in the tropical, subtropical and warm-temperate areas, it is however often cultivated in pot due to its rather moderate dimensions. Synonyms: Ghiesbreghtia mollis Roezl (1861); Agave glaucescens Hook. (1862); Agave attenuata var. compacta Jacobi (1865); Agave pruinosa Lem. ex Jacobi (1865); Agave attenuata var. subundulata Jacobi (1866); Agave attenuata var. latifolia Salm-Dyck ex A.Terracc. (1885); Agave attenuata var. paucibracteata Trel. (1914); Agave cernua A.Berger (1915). → To appreciate the biodiversity within the ASPARAGACEAE family please click here.